Forest and Wood Products Australia (FWPA) has recently published a Code of Practice focusing on fire retardant coatings and their use on timber in the building sector. Cameron Grimes reports. Forest and Wood Products Australia (FWPA) is a not for profit company that provides national research and development and promotional services on behalf of the Australian forest and wood products industry. As part of this service, a range of technical design guides have been developed for building and design professionals through its WoodSolutions program. WoodSolutions’ latest Technical Design Guide (TDG) #45, titled Code of Practice – Fire Retardant Coatings Applied to Wood Products, aims to provide a Code of Practice for the use of fire retardant coatings applied to wood-based products, in order to achieve the fire hazard properties required by the National Construction Code 2016 (NCC). Fire retardant coatings can include paints and varnishes, intumescent coatings, encapsulation coating systems and liquid surface treatments. Currently, under the NCC Volume One – Building Code of Australia Class 2 to Class 9 Buildings, these types of coating systems are not permitted to be used over timber products in order to modify fire hazard properties. Specifically, the NCC’s 2016 Deemed-to-Satisfy provisions, Clause C1.10 (b), states that “Paint or fire retardant coatings must not be used to achieve compliance with the required fire hazard properties” effectively ruling out the previously mentioned coating treatments. 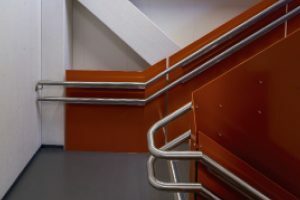 According to FWPA national codes and standards manager Boris Iskra, concerns around the inclusion of fire retardant coatings into the NCC provisions surround the application and longevity of the coating solutions. “I understand one of the concerns of regulators is how to ensure that these coating products maintain their performance over time,” Boris says. “The products may achieve the required fire hazard rating on day one, but will they achieve that rating five years down the road? This is the main reason behind the drafting and development of TDG #45. Despite fire retardant coatings not being permitted under the Deemed-to-Satisfy provisions, it does not prevent building professionals from preparing a Performance Solution as permitted by the NCC. What this involves is a third party, such as a fire engineer, preparing a solution and certifying that the proposed fire retardant coating system applied to the timber product(s) will achieve the Performance Requirement of the NCC for the required fire hazard properties. “TDG #45 is called a Code of Practice as it’s not mandatory under the NCC but it has been prepared to provide guidance to those that wish to use some sort of fire retardant coating the opportunity to do so,” Boris says. “That’s a quirk in our current building Code. Overseas, coatings are permitted to be used on timber products, but in Australia they are specifically excluded. Another concern surrounds the issue of long-term performance and durability and determining who is responsible to ensure that the coating product has been installed correctly. Because of this, TDG #45 describes the responsibility of manufacturers of fire retardant coatings to stipulate the performance of the coating system, how these coatings are to be applied, as well as an onus on the eventual applicator of the product. Though these coatings can be applied on-site, Boris suggests that for quality control purposes, the application of the product could be completed off-site to ensure consistency. “In factory conditions, it is much easier to monitor and maintain quality, because materials can be passed through machines that deliver an accurate thickness of coating,” Boris adds. “If a coating system requires two layers for example, then it can be done twice in a factory. If it’s done on site however, the applicator of the coating needs to sign off and confirm the product has been applied according to manufacturer requirements. Though the FWPA’s recent submission to the ABCB to enable the use of fire retardant coatings has not been supported, the company will continue to push to have coatings included in the NCC. “We will continue pushing such submissions as we believe there is a lot of evidence of positive use of these products around the world,” Boris says. “We just need to get over some concerns by regulators about how these coating systems should be used, maintained and inspected. “Regulators are rightly concerned about anything to do with fire following recent façade fire events and I can understand concerns in changing provisions in the NCC which have been around for decades. They want to be sure that it’s going to work before any changes are made. There are several paint manufacturers looking to introduce intumescent coating systems into the Australian market via CodeMark certification that achieve a Group 1 fire hazard performance rating when applied on timber products. It will be vital to check documentation and provide this to the Building Surveyor/Certifier for acceptance prior to any use. “This goes for any product, of course. With other paint manufacturing companies also going down the CodeMark path, it is especially important,” Boris says. This will be particularly useful as in most non-sprinklered public areas within commercial buildings, material linings must achieve a Group 1 or 2 rating. This rating is obtained through fire tests that determine the temperature at which a material will flashover. By default, most unprotected wood products achieve a Group 3 rating. The ABCB examines the merit of Code changes during the 3-year cycle. Unfortunately for FWPA, the support for change was not there to alter the specific fire retardant coating Clause C1.10(b). The Board will begin accepting new submissions in 2019, with Boris hoping to resubmit towards the end of next year. “It’s a lengthy process. We made a submission on another matter 18 months ago, with the technical review having occurred in August this year. We won’t find out whether our submission achieves final acceptance until sometime after November when the Board meets to approve changes,” Boris says. The final hurdle, according to Boris, is convincing the ABCB that fire retardant coating systems will be successfully implemented by the building sector. The use of the WoodSolutions TDG #45 in conjunction with these systems could be the next step in achieving this. “As I said, it’s more about how these products will be used in the marketplace, not if the products work. We know they work, the question is how do we properly implement them?” Boris says. “I can understand the ABCB wondering if there is a market demand for this product, but these coatings are already being used throughout New Zealand, the UK and Europe, then why can’t we use them in Australia? *This article first appeared in the summer 2018 edition of Building Connection. Click here to subscribe.